Graphicweave is a graphic design studio and web development company in Kashmir with our other office at Mumbai. We create websites, brochures, banner ads, corporate identity packages, custom software and photo-enhancement services. We have made websites for magazines, business directories, schools and the corporate sector. We also have our own specialized software for sale - Qaleen Weaver - used to generate design instructions (taleem) for carpet designing process and Carpet Accounting to cater to the needs of those in carpet designing industry. We are committed to providing the highest quality industry-specific design services and solutions within budget and under tightest deadlines. Our goal is to help our clients efficiently communicate and optimize their business process with visual design and technology solutions. Critical aspects of our work include unique creative approach, innovative and user-friendly design, state-of-the-art technology and personal attention. This is a screenshot from our website for Automobile Showroom. 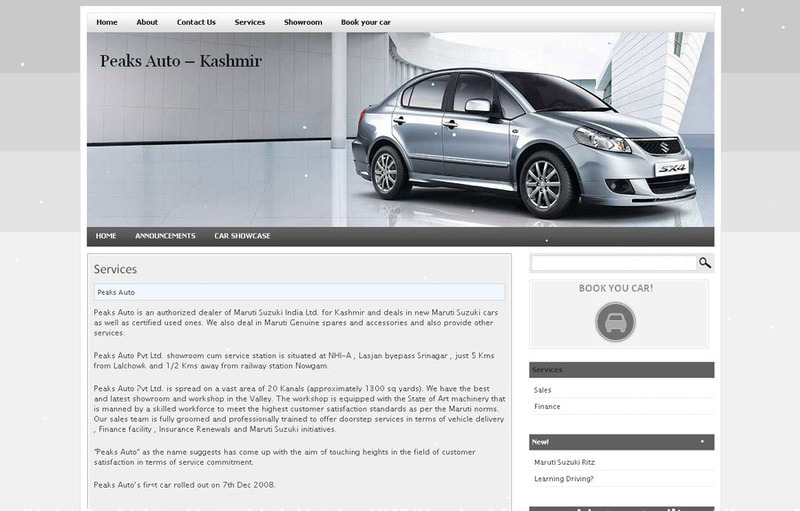 The website features, announcements (that can be added dynamically by the client) and book a car facility.